Every year, District 303 conducts a satisfaction survey eliciting feedback from our students, teachers, and parents. This year, as part of the Every Student Succeeds Act (ESSA), we will now be participating in the Illinois 5Essentials Survey. As a parent or guardian, this survey will provide you with the opportunity to share your thoughts on important elements of school effectiveness about your child’s school. All District 303 parents and teachers, as well as students in 4th through 12th grades, are being asked to complete the 5Essentials survey. After December 10, students and staff will have the opportunity to take the survey in their buildings. The District intends for all student and staff surveys to be completed by winter break. We value your feedback and appreciate you taking the time to provide us with your suggestions for improvement. Your identity and survey responses will be kept completely confidential and will never be connected to you or your child. To take the parent survey please visit https://survey.5-essentials.org/Illinois/ and select the appropriate survey. Below, you will find a graphic of the survey login page with some additional information about how to access the survey. Most notably, make sure you put Kane in the box for County, even if you live in DuPage County. 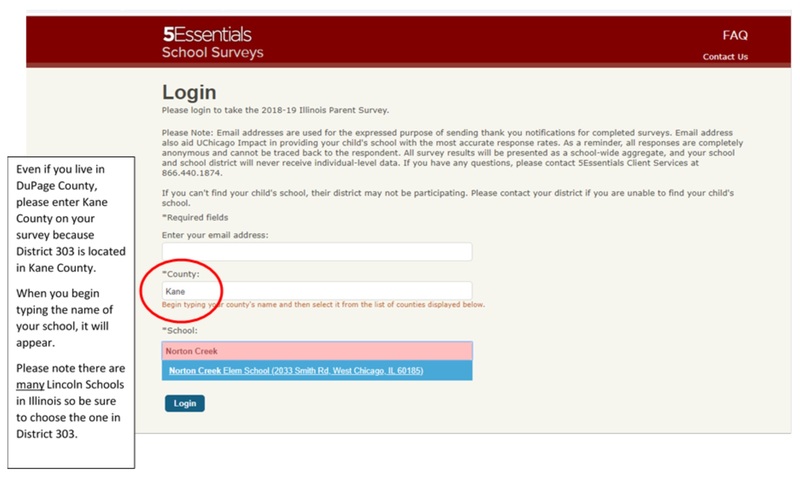 This will allow you to correctly select your child’s D303 school. If you have questions about District 303’s participation in this survey, please contact the D303 office of assessment at D303assessment@d303.org, or call 331-228-4919. If you have questions about the 5Essentials Survey, please contact 5Essentials Client Services at 1-866-440-1874 or 5essentials@uchicago.edu.